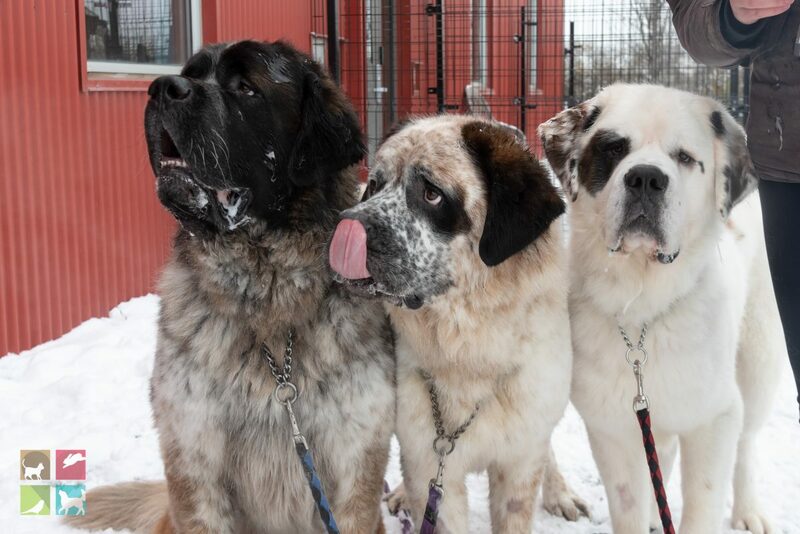 EDMONTON, AB (October 10, 2018) – Since putting out the call for help to find a forever home for a trio of bonded Saint Bernard dogs, we have received an incredible response from interested adopters. Over 200 emails have come in so far from people who generously want to open their hearts and homes to these three dogs – including within Alberta, across the country, and even in the United States and Australia. Due to the overwhelming response, we are closing applications for the time being as we review the ones received and begin to schedule adoption interviews. We are hoping to find a suitable home closer to Edmonton as these dogs have been through a lot of change the last few months, and we want to minimize stress as much as possible for them. With the number of applications received, we are confident we will be able to find a forever home nearby for Goliath, Gunther and Gasket that will keep them together. Thanks to the power of social media, we have also had a few people come forward who knew these three pups when they were younger and have been able to share some more details on them. They have confirmed the three dogs are littermates and have been together since birth. They are just over five years old, which came as surprise to us, as their teeth are in incredible condition for a giant breed dog. They also shared that these dogs do everything together, including eating out of the same bowl, which is something we have noticed during their stay in our shelter too. We want to extend our sincerest thanks to everyone who has helped share their story in an effort to connect these gentle giants with their new family. We encourage people to check out their local humane societies, SPCAs and rescues if they are ready to bring home a new pet; there are thousands of animals all deserving of a second chance, and new one come in to the care of shelters every day. If you are not ready to adopt, donations are always appreciated too as organizations like ours rely on the generosity of our community to provide care for animals like Gasket, Gunther and Goliath. We will be sure to share an update when these three are adopted and heading to their new home! To view all of the Edmonton Humane Society’s adoptable pets click here, or to make a donation towards our shelter animals’ care, click here.